Find hotel near Wat Ratchabopit Sathitmah ..
Apart from its massages, nightlife and shopping, Bangkok is popular for its heavenly Buddhist temples and the Wat Ratchabopit Sathitmahasimaram Ratchaworawihan is an example of the same. Lying within the proximity of two prime attractions of Bangkok- the Grand Palace and Wat Pho, this Buddhist temple draws several visitors daily. Both, exteriors and interiors boast amazing features owing to a classic construction style that dates back to the rule of King Chulalongkorn or Rama V. While the temple is a sight by itself, the Royal Cemetery at its west end, further amplifies its appeal. This cemetery holds the graves of some of the members of the royal family including f Mahidol Adulyadej, Galyani Vadhana and Srinagarindra. An ideal Bangkok trip includes top things to do in Bangkok like Wat Pho Reclining Buddha, B T S Skytrain, Rajawongse Clothier, Grand Palace and Wat Phra Kaew. 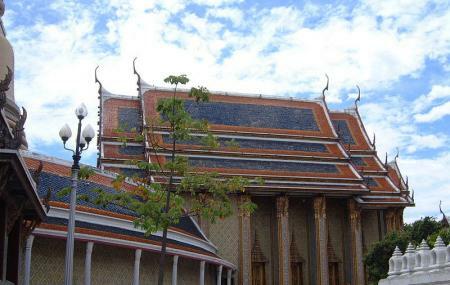 Bangkok is replete with experiences which can be enjoyed with any of the Bangkok tours! Make your visit suitable to your interest, use Bangkok trip planner for personalization. Add accommodation and hotels in Bangkok that suit your budget including the most recommended ones like Pas Cher Hotel De Bangkok, Ibis Bangkok Riverside, Kokotel Bangkok Surawong and Marvin Suites. How popular is Wat Ratchabopit Sathitmahasimaram Ratchaworawihan? People normally club together Seven Flavours Steam Seafood and Wat Chakrawatrachawat Woramahawihan while planning their visit to Wat Ratchabopit Sathitmahasimaram Ratchaworawihan. How extinct it is! The abbot is new Supreme Patriarch of Thailand artfully combined with western and Thai concept designs. To know more about Thai culture and religion while traveling is better than sit in a 9 ball beer bar wasting your precious vacation time . Beautiful temple, worth a visit. Peaceful atmosphere - not as busy as other temples. If you want to avoid the tourist groups, this is the place for you. April 2019. Restauration almost completed. Such a great place, shining, colorful. Do not let the restauration work prevent you to enter and visit. Very beautiful. most impressive for decoratipn inside main chapel. european style inside thai temple . A temple tourists should visit. Lucky today, the pagoda opens.